is it love that dare not be? Bursting forth like a lucid dream, this release unearths powerful connections to deeper truths. Sue-Kenny’s folk approach and Oscar’s intense voice guide the way through Sam’s tales of existential personal introspection. “One of the most caring musical treasures to come along in quite some time. Don’t pass up the chance to experience it.” – JUST MUSIC. beneath hope by a frayed thread.” – ALTERNATIVE PRESS. “We’re talking deep European existential despair here, the fevered outpouring of a tortured soul.” – OPTION. “This release is an interesting artsy excursion into subtle electronics by this three piece band. Musically, it’s a little hard to characterize. The songs are full of Nietzsche-influenced, depressing lyrics that are wrapped in surprisingly melodic and engaging experimental music. File this one under odd, but interesting.” -RELIX. A new location brings a new release from writer and electronics wizard Sam Rosenthal and his roving band. Formed in Cooper City, Florida in the late 1985, this is primarily a trio that also includes vocalists Sue-Kenny Smith and Oscar Herrera. Herrera’s vocals remind one of early English Gothic bands, while Smith, an Englishwoman, transports the listener into a realm of existential, ethereal, and ambient musings… somewhat lost and free at the same time. This music is an acquired taste, resembling a lot of the material found on Britain’s 4AD label. 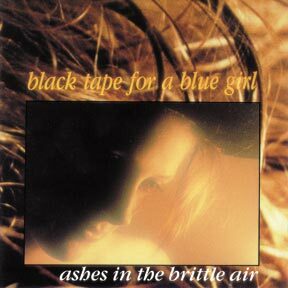 But for those of you who like a philosophical slant to their music, and for those who enjoy rich tapestries and aural textures, this third release from Black Tape For a Blue Girl represents their best work to date. As we postmodernists shuffle off our mortal coil, our demise will undoubtedly be scored to one of the many 4AD releases that have defined bad-mood music in the late 80’s. Until now, we’ve had to import our choler and phelgm from that fine English label, but Black Tape for A Blue Girl do a reasonable approximation of the 4AD vibe around the corner in Garden Grove. Their third release comes complete with Sue Kenny-Smith’s British vocals and acoustic guitar, Sam Rosenthal’s euphonious electronics, and obscurantist lyrics that tell tales of misconnection and emotional impotence. The homages to Breathless and Dead Can Dance are unavoidable but managed skillfully. This is languid, lucid music that suffers only from the inevitable comparison to those who went before, and its own intellectual heaviness, evident in quotes from Nietzsche and song titles such as “The Scar of A Poet.” This album does a neat disappearing trick, too, opening with the most powerful and complex songs, and working its way down to omnious ambient keyboards and wistful folk melodies. Black Tape doesn’t need to lighten up, but rather to thicken up. Their entropy is infectious. Snaking out of the Garden Grove like an elusive trail of opium smoke, the myriad voices and wispy melodies of Black Tape for A Blue Girl weave a snakecharmer’s trance. 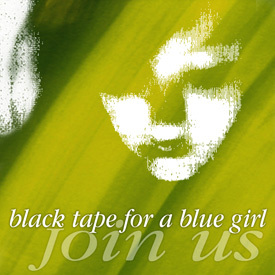 Basically composed of three people, with a cast of several helping out on different tracks, Black Tape tries on different veils throughout the LP, at times imitating a sea of singing orcas, at others delievering what sounds like Arabian love chants, and every now and then diving off into almost unfathomably deep ends. The electronic instruments and manipulations and Sue-Kenny Smith’s seraphic vocals are the guiding points to the beyond-all-earthly-concerns aura flowing lavishly from this record, though the more conventional guitars, violin, clarinet and piano ( only two cuts feature percussion of any kind) manage to drift into similar ozone regions. Though it’s not difficult to tie threads of Ashes to Shellylan Orphan or general 4AD ethereality, Black Tape emanates a strange. quiet beauty, one that’s meant to haunt the listener, and more often then not, will. Top cuts from the beyond: “Through Sky Blue Rooms,” ” Am I So Deceived” and the title track. 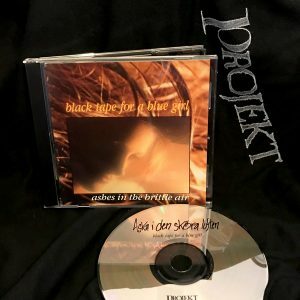 Black Tape’s third full album takes the band to a new level of grace; while bandleader Rosenthal’s work remains generally consistent – ambient soundscapes mingled with low-key rock mood pieces, backing Rosenthal’s varying studies of romantic obsession and fragmentation – the various performances here are more involving than ever. Herrera and Kenny-Smith return as the major vocalists, along with Rosenthal himself on ‘slight vocals’ and electronics; a bevy of other guest performances flesh out the album as a whole, from guitars to clarinet and violin. The opening title track proved to be the best Black Tape song up to that point, starting with a gentle wash of electronics suddenly punctuated by a tribal percussion hit – wonderfully echoed and layered for atmosphere – and Kenny-Smith’s delicate take on the lyrics. Herrera himself gets to shine in the very next number, “Across A Thousand Blades,” one of the more overtly goth-rock numbers Black Tape has recorded, with a pulsing rhythm, Cure/Banshees-like guitar and fretless bass adding to Herrera’s anguished performance. The rest of the album doesn’t quite match up to such an excellent beginning, but as a consistent collection of songs and performances, Ashes is never anything less that tastefully atmospheric, and often more than that, a perfect soundtrack to a late night.